"When people in developing countries don’t have access to a bank account, physical proximity to a bank is usually the first challenge that springs to mind, but sometimes the reason a person is unable to access a secure place to store their savings is as simple as them not having a piece of paper to prove who they are. Banking regulations vary between countries, and some allow banks to set their own rules about what proof of identity they accept for new customers to make sure no one is excluded. In South Africa Standard Bank accepts a letter verifying a person’s address from a tribal chief for certain accounts, while Postbank offers a Mzansiaccount, which does not require any proof of address but only offers basic transactional services and has a balance limit of 25,000 South African Rand (£1,362). However, international banking standards set by the intergovernmental Financial Action Taskforce recommend that people opening an account provide specific documents. These “know your customer” (KYC) guidelines are not new, and have prevented poorer communities from accessing bank accounts for years. 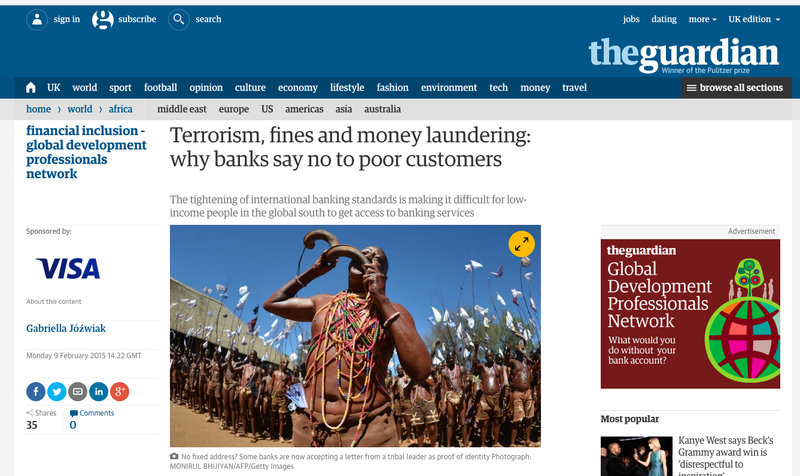 But there is increasing concern that KYC is becoming more restrictive, making access to finance harder for local banks and populations and damaging developing economies’ opportunity to grow..."
Read the full article on the Guardian Global Development Professionals Network.